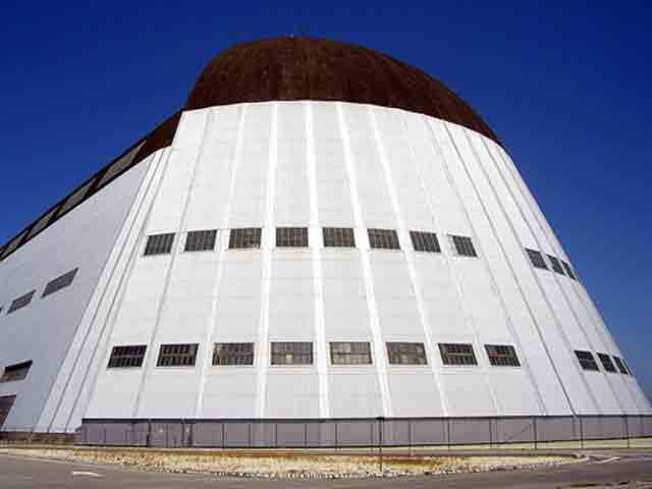 One of the hangars at Moffett Field. Bringing the World Expo to Silicon Valley in 2020 could generate $440 million in state and local tax revenue, draw 25 million visitors and create 42,000 jobs, according to a new report released by bid organizers. The Bay Area Council, a regional business organization spearheading a campaign to hold the event at Moffett Field, released the report over the weekend that said the six-month event would cost about $1 billion to plan and operate but could stimulate about $5.6 billion in economic activity. That's quadruple the estimated economic impact the 2013 America's Cup race is expected to bring to the area. "The report is glowing and probably exceeds our optimistic expectations," Bay Area Council President and CEO Jim Wunderman told the San Francisco Chronicle. "It isn't the Olympics, but then again, it goes for six months." Former Gov. Arnold Schwarzenegger first announced the proposal last September to hold the 2020 event at the former military air base. At the time, he was visiting the 2010 Shanghai Expo. California hasn't hosted a world's fair since 1939, when Treasure Island was built in the middle of San Francisco Bay to hold the event. The Bay Area Council says it hopes to begin working with Gov. Jerry Brown's office as soon as next month and talk to other aspiring host cities, including Houston and Minneapolis. Final bids for the Expo, held every five years, are due next year. A decision by the Paris-based Bureau of International Expositions is expected by 2014, giving the host city about seven years to prepare for the massive gathering. For U.S. cities to qualify, Congress would have to renew the nation's membership with the group. The U.S. dropped out in 2002 because of unpaid dues and would have to cut a check for $33,000 to get back in.